DIY Girls has served 3,294 girls in Los Angeles since 2012. Luz Rivas has dedicated her professional career fighting to ensure every Californian has the opportunity to learn, prosper and succeed. With a Bachelor's degree in Electrical Engineering from MIT and a Master's degree in Education from Harvard, Luz has focused on encouraging young girls to pursue training and careers in science, engineering, and technology. The founder of DIY Girls, a nonprofit organization dedicated to helping girls become interested in math and science, Luz has helped set thousands of young women on the path towards economic empowerment, independence, and self-confidence. Luz has always had love for technology and science, and she has seen firsthand how these fields can allow girls and boys to become successful professionals. She dedicated herself to helping other young individuals develop an interest in technology, just as the mentors in her life encouraged her to. Luz was raised in the Northeast San Fernando Valley by a single mother who cleaned bathrooms at a hospital in Lakeview Terrace. Initially the family rented a room in a house, and later lived in a converted garage and back houses in Pacoima, San Fernando and Arleta. Her mother took night classes to learn English and office skills, and ultimately got a new job. As a fifth grader at Telfair Elementary in Pacoima, Luz became interested in technology and engineering when her teacher taught her class how to program an Apple IIe computer. That's when she knew that she loved technology. At Pacoima Middle School, she continued learning about computer science, and at San Fernando High School, she enrolled in a state program that helped students excel in math and science and go on to college in these fields. While Luz was in high school, her mom was laid off, so Luz worked two jobs to save money for college. Her math teacher encouraged her to apply to MIT and she was admitted. At first, Luz was nervous about leaving her family and friends in the San Fernando Valley, but a family friend loaned her $300 for a plane ticket so she could visit the campus. She fell in love with the school and four years later, Luz graduated with a degree in Electrical Engineering. Soon after graduating, she was hired as an Electrical Engineer at Motorola but, her passion to get kids interested in science and technology ultimately led her to earn a Master's of Education from Harvard University. 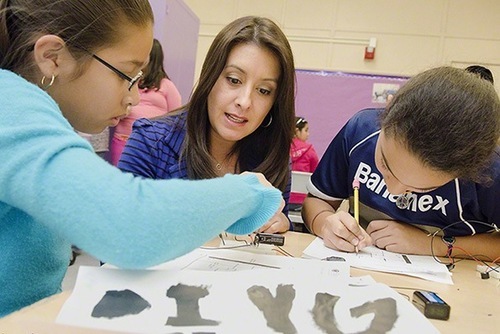 After graduating, she returned to the Valley, and in 2011, Luz founded DIY Girls, a nonprofit based in the Valley that encourages young girls to become interested in science and technology. Since 2012, the program has served over 2000 girls from grades 4-12, helping them develop skills as engineering and designers. DIY Girls works with partner schools throughout the Northeast Valley to create new science and technology programs. They have also organized workshops and events for hundreds of women throughout Los Angeles, where they have had the opportunity to learn new skills and connect with tech leaders. Many of these women have found mentors, training opportunities, and transitioned to new careers. In October 2016, Luz continued breaking barriers when she was appointed to the Los Angeles Public Works Commission where she continued her gender equity work. She also led a recruitment initiative for women engineers in Public Works by reaching out to groups like the Society of Women Engineers to increase the number of women applicants. Luz won the special election for the California State Assembly 39th District seat and was sworn in on June 11, 2018. Luz Rivas is humbled and honored to have the opportunity to serve the community she grew up in. Our values guide our decisions and interactions with girls, families, and partners. Creative Freedom - We use our head, hands and hearts to create. Opportunity - We move towards opportunity. We're always seeking next steps. Relationships - We do it ourselves but not alone. Partnerships are essential to our work. Empowerment - We believe in her so that she can. All girls can innovate. Skill-Building - It takes time to develop skills and nothing happens in a day. We offer programs for girls in 5th-12th grade, predominantly in the Northeast San Fernando Valley region of Los Angeles.